There are probably as many ways to stencil as there are stencilers, but for the most part they are variations of the same basic techniques. Here are some tips about the way I like to stencil, but since I am not a terribly talented writer or teacher, I encourage you to take advantage of any books, videos, or local classes available to you. If you are lucky enough to live near a stencil shop, sign up for a class! Visit your local library for books or videos. Check out our Books and Videos pages for some recommendations. Brushes – Good quality, natural bristle stencil brushes. You’ll want one brush for each paint color you will be using. 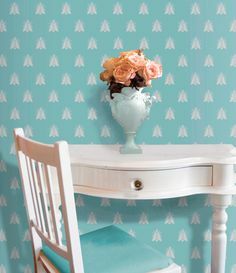 Paint – As all my stenciling friends will tell you, I am a die-hard stencil creme fan. If you want to use acrylics, you might as well stop reading here. There are a few different brands of the oil type stencil paints. I tend to use Delta’s, because it is readily available locally. Pencil – to mark registration marks. Paper towels – for off-loading your paint and cleaning your stencils. My favorite brand is Viva. A lot of stencilers I know like Bounty. Whatever brand you pick, make sure they are good quality. Magic Wand – Okay, it’s just an eraser, but if you make a mistake on a wall with the stencil creams or paintstik, it can work magic. You can find them at any office store. Click here to see what I’m talking about. Murphy’s Oil Soap – If you’re using oils, this and your brush scrubber will clean your brushes in no time flat. Paper Grocery bag – to discard your paint covered tissues, paper towels, and paint bits. Gather your supplies together. Open your grocery bag and set it next to you. Open your paint. It will have a skin on top, which you must remove with a tissue or paper towel. As soon as you get that skin off, stick it and the paper towel straight in your grocery bag. Trust me on this one—those bits of paint are permanent, and you don’t want to track them round the house on your shoes! In fact, I recommend holding the jar of paint over the bag while you de-skin. Tape your stencil in place. I prefer to tape only across the top, so I can check my progress as I go by lifting the stencil. Mark your registration marks for multiple overlay stencils. For practice proofs, you may want to do this directly on your surface. For walls, I place a small piece of painters or masking tape behind the stencil, and mark on that. Load your brush by swirling it in the paint. Offload!! Remember, stenciling is as dry brush technique. The stencil cremes are more forgiving than acrylics on this point, but you still need to offload some paint. Swirl your brush on a paper towel. You’re not wasting paint, you’re working into the bristles of your brush! Keeping your stencil brush perpendicular to the surface you are painting, swirl or pounce along the edges of the stencil opening, working inward, until the desired effect is achieved. Repeat until you’re finished, then step back and admire your work. Don’t forget to clean your brushes with the brush scrubber and Murphy’s Oil Soap. I strongly suggest doing a practice board before you try stenciling on a wall. I usually use plain poster board, base coated with the wall color.